Not to be confused with keyboard computer. Keyboard keys (buttons) typically have characters engraved or printed on them, and each press of a key typically corresponds to a single written symbol. However, producing some symbols may require pressing and holding several keys simultaneously or in sequence. While most keyboard keys produce letters, numbers or signs (characters), other keys or simultaneous key presses can produce actions or execute computer commands. In normal usage, the keyboard is used as a text entry interface for typing text and numbers into a word processor, text editor or any other program. In a modern computer, the interpretation of key presses is generally left to the software. A computer keyboard distinguishes each physical key from every other key and reports all key presses to the controlling software. Keyboards are also used for computer gaming — either regular keyboards or keyboards with special gaming features, which can expedite frequently used keystroke combinations. A keyboard is also used to give commands to the operating system of a computer, such as Windows' Control-Alt-Delete combination. Although on Pre-Windows 95 Microsoft operating systems this forced a re-boot, now it brings up a system security options screen. A command-line interface is a type of user interface navigated entirely using a keyboard, or some other similar device that does the job of one. While typewriters are the definitive ancestor of all key-based text entry devices, the computer keyboard as a device for electromechanical data entry and communication derives largely from the utility of two devices: teleprinters (or teletypes) and keypunches. It was through such devices that modern computer keyboards inherited their layouts. As early as the 1870s, teleprinter-like devices were used to simultaneously type and transmit stock market text data from the keyboard across telegraph lines to stock ticker machines to be immediately copied and displayed onto ticker tape. The teleprinter, in its more contemporary form, was developed from 1907 to 1910 by American mechanical engineer Charles Krum and his son Howard, with early contributions by electrical engineer Frank Pearne. Earlier models were developed separately by individuals such as Royal Earl House and Frederick G. Creed. Earlier, Herman Hollerith developed the first keypunch devices, which soon evolved to include keys for text and number entry akin to normal typewriters by the 1930s. The keyboard on the teleprinter played a strong role in point-to-point and point-to-multipoint communication for most of the 20th century, while the keyboard on the keypunch device played a strong role in data entry and storage for just as long. The development of the earliest computers incorporated electric typewriter keyboards: the development of the ENIAC computer incorporated a keypunch device as both the input and paper-based output device, while the BINAC computer also made use of an electromechanically controlled typewriter for both data entry onto magnetic tape (instead of paper) and data output. The keyboard remained the primary, most integrated computer peripheral well into the era of personal computing until the introduction of the mouse as a consumer device in 1984. By this time, text-only user interfaces with sparse graphics gave way to comparatively graphics-rich icons on screen. However, keyboards remain central to human-computer interaction to the present, even as mobile personal computing devices such as smartphones and tablets adapt the keyboard as an optional virtual, touchscreen-based means of data entry. One factor determining the size of a keyboard is the presence of duplicate keys, such as a separate numeric keyboard or two each of Shift, ALT and CTL for convenience. Further the keyboard size depends on the extent to which a system is used where a single action is produced by a combination of subsequent or simultaneous keystrokes (with modifier keys), or multiple pressing of a single key. A keyboard with few keys is called a keypad. Another factor determining the size of a keyboard is the size and spacing of the keys. Reduction is limited by the practical consideration that the keys must be large enough to be easily pressed by fingers. Alternatively a tool is used for pressing small keys. Standard alphanumeric keyboards have keys that are on three-quarter inch centers (0.750 inches, 19.05 mm), and have a key travel of at least 0.150 inches (3.81 mm). Desktop computer keyboards, such as the 101-key US traditional keyboards or the 104-key Windows keyboards, include alphabetic characters, punctuation symbols, numbers and a variety of function keys. The internationally common 102/104 key keyboards have a smaller left shift key and an additional key with some more symbols between that and the letter to its right (usually Z or Y). Also the enter key is usually shaped differently. Computer keyboards are similar to electric-typewriter keyboards but contain additional keys, such as the command or Windows keys. There is no standard computer keyboard, although many manufacturers imitate the keyboard of PCs. There are actually three different PC keyboards: the original PC keyboard with 84 keys, the AT keyboard also with 84 keys and the enhanced keyboard with 101 keys. The three differ somewhat in the placement of function keys, the control keys, the return key, and the shift key. Keyboards on laptops usually have a shorter travel distance and a reduced set of keys. Keyboards on laptops and notebook computers usually have a shorter travel distance for the keystroke, shorter over travel distance, and a reduced set of keys. They may not have a numeric keypad, and the function keys may be placed in locations that differ from their placement on a standard, full-sized keyboard. The switch mechanism for a laptop keyboard is more likely to be a scissor switch than a rubber dome; this is opposite the trend for full-size keyboards. Flexible keyboards are a junction between normal type and laptop type keyboards: normal from the full arrangement of keys, and laptop from the short key distance. Additionally, the flexibility allows the user to fold/roll the keyboard for better storage and transfer. However, for typing the keyboard must be resting on a hard surface. The vast majority of flexible keyboards in the market are made from silicone; this material makes them water- and dust-proof. This is useful in hospitals, where keyboards are subjected to frequent washing, and other dirty or must-be-clean environments. Handheld ergonomic keyboards are designed to be held like a game controller, and can be used as such, instead of laid out flat on top of a table surface. Typically handheld keyboards hold all the alphanumeric keys and symbols that a standard keyboard would have, yet only be accessed by pressing two sets of keys at once; one acting as a function key similar to a 'Shift' key that would allow for capital letters on a standard keyboard. Handheld keyboards allow the user the ability to move around a room or to lean back on a chair while also being able to type in front or away from the computer. Some variations of handheld ergonomic keyboards also include a trackball mouse that allow mouse movement and typing included in one handheld device. Smaller external keyboards have been introduced for devices without a built-in keyboard, such as PDAs, and smartphones. Small keyboards are also useful where there is a limited workspace. A thumb keyboard (thumb board) is used in some personal digital assistants such as the Palm Treo and BlackBerry and some Ultra-Mobile PCs such as the OQO. Numeric keyboards contain only numbers, mathematical symbols for addition, subtraction, multiplication, and division, a decimal point, and several function keys. They are often used to facilitate data entry with smaller keyboards that do not have a numeric keypad, commonly those of laptop computers. These keys are collectively known as a numeric pad, numeric keys, or a numeric keypad, and it can consist of the following types of keys: Arithmetic operators, numbers, arrow keys, Navigation keys, Num Lock and Enter key. Multifunctional keyboards provide additional function beyond the standard keyboard. Many are programmable, configurable computer keyboards and some control multiple PCs, workstations (incl. SUN) and other information sources (incl. Thomson Reuters FXT/Eikon, Bloomberg, EBS, etc.) usually in multi-screen work environments. Users have additional key functions as well as the standard functions and can typically use a single keyboard and mouse to access multiple sources. Multifunctional keyboards may feature customised keypads, fully programmable function or soft keys for macros/pre-sets, biometric or smart card readers, trackballs, etc. New generation multifunctional keyboards feature a touchscreen display to stream video, control audio visual media and alarms, execute application inputs, configure individual desktop environments, etc. Multifunctional keyboards may also permit users to share access to PCs and other information sources. Multiple interfaces (serial, USB, audio, Ethernet, etc.) are used to integrate external devices. Some multifunctional keyboards are also used to directly and intuitively control video walls. Common environments for multifunctional keyboards are complex, high-performance workplaces for financial traders and control room operators (emergency services, security, air traffic management; industry, utilities management, etc.). While other keyboards generally associate one action with each key, chorded keyboards associate actions with combinations of key presses. Since there are many combinations available, chorded keyboards can effectively produce more actions on a board with fewer keys. Court reporters' stenotype machines use chorded keyboards to enable them to enter text much faster by typing a syllable with each stroke instead of one letter at a time. The fastest typists (as of 2007) use a stenograph, a kind of chorded keyboard used by most court reporters and closed-caption reporters. Some chorded keyboards are also made for use in situations where fewer keys are preferable, such as on devices that can be used with only one hand, and on small mobile devices that don't have room for larger keyboards. Chorded keyboards are less desirable in many cases because it usually takes practice and memorization of the combinations to become proficient. Software keyboards or on-screen keyboards often take the form of computer programs that display an image of a keyboard on the screen. Another input device such as a mouse or a touchscreen can be used to operate each virtual key to enter text. Software keyboards have become very popular in touchscreen enabled cell phones, due to the additional cost and space requirements of other types of hardware keyboards. Microsoft Windows, Mac OS X, and some varieties of Linux include on-screen keyboards that can be controlled with the mouse. In software keyboards, the mouse has to be maneuvered onto the on-screen letters given by the software. On the click of a letter, the software writes the respective letter on the respective spot. Projection keyboards project an image of keys, usually with a laser, onto a flat surface. The device then uses a camera or infrared sensor to "watch" where the user's fingers move, and will count a key as being pressed when it "sees" the user's finger touch the projected image. Projection keyboards can simulate a full size keyboard from a very small projector. Because the "keys" are simply projected images, they cannot be felt when pressed. Users of projected keyboards often experience increased discomfort in their fingertips because of the lack of "give" when typing. A flat, non-reflective surface is also required for the keys to be projected. Most projection keyboards are made for use with PDAs and smartphones due to their small form factor. Also known as photo-optical keyboard, light responsive keyboard, photo-electric keyboard and optical key actuation detection technology. An optical keyboard technology utilizes LEDs and photo sensors to optically detect actuated keys. Most commonly the emitters and sensors are located in the perimeter, mounted on a small PCB. The light is directed from side to side of the keyboard interior and it can only be blocked by the actuated keys. Most optical keyboards require at least 2 beams (most commonly vertical beam and horizontal beam) to determine the actuated key. Some optical keyboards use a special key structure that blocks the light in a certain pattern, allowing only one beam per row of keys (most commonly horizontal beam). There are a number of different arrangements of alphabetic, numeric, and punctuation symbols on keys. These different keyboard layouts arise mainly because different people need easy access to different symbols, either because they are inputting text in different languages, or because they need a specialized layout for mathematics, accounting, computer programming, or other purposes. The United States keyboard layout is used as default in the currently most popular operating systems: Windows, Mac OS X and Linux. The common QWERTY-based layout was designed early in the era of mechanical typewriters, so its ergonomics were compromised to allow for the mechanical limitations of the typewriter. The QWERTZ layout is widely used in Germany and much of Central Europe. The main difference between it and QWERTY is that Y and Z are swapped, and most special characters such as brackets are replaced by diacritical characters. Another situation takes place with "national" layouts. Keyboards designed for typing in Spanish have some characters shifted, to release the space for Ñ ñ; similarly, those for Portuguese, French and other European languages may have a special key for the character Ç ç. The AZERTY layout is used in France, Belgium and some neighbouring countries. It differs from the QWERTY layout in that the A and Q are swapped, the Z and W are swapped, and the M is moved from the right of N to the right of L (where colon/semicolon is on a US keyboard). The digits 0 to 9 are on the same keys, but to be typed the shift key must be pressed. The unshifted positions are used for accented characters. Keyboards in many parts of Asia may have special keys to switch between the Latin character set and a completely different typing system. Japanese layout keyboards can be switched between various Japanese input methods and the Latin alphabet by signaling the operating system's input interpreter of the change, and some operating systems (namely the Windows family) interpret the character "\" as "¥" for display purposes without changing the bytecode which has led some keyboard makers to mark "\" as "¥" or both. Arabic keyboard - In the Arab world, keyboards can often be switched between Arabic and Latin characters. In Microsoft word, ALT+Shift allows shifting between languages. Alphabetical, numeric, and punctuation keys are used in the same fashion as a typewriter keyboard to enter their respective symbol into a word processing program, text editor, data spreadsheet, or other program. Many of these keys will produce different symbols when modifier keys or shift keys are pressed. The alphabetic characters become uppercase when the shift key or Caps Lock key is depressed. The numeric characters become symbols or punctuation marks when the shift key is depressed. The alphabetical, numeric, and punctuation keys can also have other functions when they are pressed at the same time as some modifier keys. The Space bar is a horizontal bar in the lowermost row, which is significantly wider than other keys. Like the alphanumeric characters, it is also descended from the mechanical typewriter. Its main purpose is to enter the space between words during typing. It is large enough so that a thumb from either hand can use it easily. Depending on the operating system, when the space bar is used with a modifier key such as the control key, it may have functions such as resizing or closing the current window, half-spacing, or backspacing. In computer games and other applications the key has myriad uses in addition to its normal purpose in typing, such as jumping and adding marks to check boxes. In certain programs for playback of digital video, the space bar is used for pausing and resuming the playback. Modifier keys are special keys that modify the normal action of another key, when the two are pressed in combination. For example, Alt+F4 in Microsoft Windows will close the program in an active window. In contrast, pressing just F4 will probably do nothing, unless assigned a specific function in a particular program. By themselves, modifier keys usually do nothing. The most widely used modifier keys include the Control key, Shift key and the Alt key. The AltGr key is used to access additional symbols for keys that have three symbols printed on them. On the Macintosh and Apple keyboards, the modifier keys are the Option key and Command key, respectively. On MIT computer keyboards, the Meta key is used as a modifier and for Windows keyboards, there is a Windows key. Compact keyboard layouts often use a Fn key. "Dead keys" allow placement of a diacritic mark, such as an accent, on the following letter (e.g., the Compose key). The Enter/Return key typically causes a command line, window form or dialog box to operate its default function, which is typically to finish an "entry" and begin the desired process. In word processing applications, pressing the enter key ends a paragraph and starts a new one. Navigation keys or cursor keys include a variety of keys which move the cursor to different positions on the screen. Arrow keys are programmed to move the cursor in a specified direction; page scroll keys, such as the Page Up and Page Down keys, scroll the page up and down. The Home key is used to return the cursor to the beginning of the line where the cursor is located; the End key puts the cursor at the end of the line. The Tab key advances the cursor to the next tab stop. The Insert key is mainly used to switch between overtype mode, in which the cursor overwrites any text that is present on and after its current location, and insert mode, where the cursor inserts a character at its current position, forcing all characters past it one position further. The Delete key discards the character ahead of the cursor's position, moving all following characters one position "back" towards the freed place. On many notebook computer keyboards the key labeled Delete (sometimes Delete and Backspace are printed on the same key) serves the same purpose as a Backspace key. The Backspace key deletes the preceding character. Lock keys lock part of a keyboard, depending on the settings selected. The lock keys are scattered around the keyboard. Most styles of keyboards have three LEDs indicating which locks are enabled, in the upper right corner above the numeric pad. The lock keys include Scroll lock, Num lock (which allows the use of the numeric keypad), and Caps lock. The SysRq and Print screen commands often share the same key. SysRq was used in earlier computers as a "panic" button to recover from crashes (and it is still used in this sense to some extent by the Linux kernel; see Magic SysRq key). The Print screen command used to capture the entire screen and send it to the printer, but in the present it usually puts a screenshot in the clipboard. The Break key/Pause key no longer has a well-defined purpose. Its origins go back to teleprinter users, who wanted a key that would temporarily interrupt the communications line. The Break key can be used by software in several different ways, such as to switch between multiple login sessions, to terminate a program, or to interrupt a modem connection. In programming, especially old DOS-style BASIC, Pascal and C, Break is used (in conjunction with Ctrl) to stop program execution. In addition to this, Linux and variants, as well as many DOS programs, treat this combination the same as Ctrl+C. On modern keyboards, the break key is usually labeled Pause/Break. In most Windows environments, the key combination Windows key+Pause brings up the system properties. The Escape key (often abbreviated Esc) "nearly all of the time" signals Stop - QUIT - let me "get out of a dialog" (or pop-up window): LET ME ESCAPE. Another common application today of the Esc key is to trigger the Stop button in many web browsers. ESC was part of the standard keyboard on the DEC VT50, introduced July 1974; it was not part of the 1970-introduced VT05. The TECO and Emacs text editors use the Esc key extensively. Historically it also served as a type of shift key, such that one or more following characters were interpreted differently, hence the term Escape sequence, which refers to a series of characters, usually preceded by the Escape character. On machines running Microsoft Windows, prior to the implementation of the Windows key on keyboards, the typical practice for invoking the "start" button was to hold down the control key and press escape. This process still works in Windows 95, 98, Me, NT 4, 2000, XP, Vista, 7, 8, and 10. The Enter key is located: One in the alphanumeric keys and the other one is in the numeric keys. When one worked something on their computer and wanted to do something with their work, pressing the enter key would do the command they ordered. Another function is to create a space for next paragraph. When one typed and finished typing a paragraph and they wanted to have a second paragraph, they could press enter and it would do spacing. Shift key: when one presses shift and a letter, it will capitalize the letter pressed with the shift key. Another use is to type more symbols than appear to be available, for instance the apostrophe key is accompanied with a quotation mark on the top. If one wants to type the quotation mark but pressed that key alone, the symbol that would appear would be the apostrophe. The quotation mark will only appear if both the required key and the Shift key are pressed. The Menu key or Application key is a key found on Windows-oriented computer keyboards. It is used to launch a context menu with the keyboard rather than with the usual right mouse button. The key's symbol is usually a small icon depicting a cursor hovering above a menu. On some Samsung keyboards the cursor in the icon is not present, showing the menu only. This key was created at the same time as the Windows key. This key is normally used when the right mouse button is not present on the mouse. Some Windows public terminals do not have a Menu key on their keyboard to prevent users from right-clicking (however, in many Windows applications, a similar functionality can be invoked with the Shift+F10 keyboard shortcut). Many, but not all, computer keyboards have a numeric keypad to the right of the alphabetic keyboard, often separated from the other groups of keys such as the function keys and system command keys, which contains numbers, basic mathematical symbols (e.g., addition, subtraction, etc. ), and a few function keys. On Japanese/Korean keyboards, there may be Language input keys for changing the language to use. 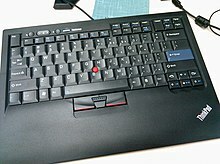 Some keyboards have power management keys (e.g., power key, sleep key and wake key); Internet keys to access a web browser or E-mail; and/or multimedia keys, such as volume controls; or keys that can be programmed by the user to launch a specified application or a command like minimizing all windows. When we calculate, we use these numeric keys to type numbers. Symbols concerned with calculations such as addition, subtraction, multiplication and division symbols are located in this group of keys. The enter key in this keys indicate the equal sign. It is possible to install multiple keyboard layouts within an operating system and switch between them, either through features implemented within the OS, or through an external application. Microsoft Windows, Linux, and Mac provide support to add keyboard layouts and choose from them. The character code produced by any key press is determined by the keyboard driver software. A key press generates a scancode which is interpreted as an alphanumeric character or control function. Depending on operating systems, various application programs are available to create, add and switch among keyboard layouts. Many programs are available, some of which are language specific. The arrangement of symbols of specific language can be customized. An existing keyboard layout can be edited, and a new layout can be created using this type of software. For example, Ukelele [sic] for Mac, The Microsoft Keyboard Layout Creator and open-source Avro Keyboard for Windows provide the ability to customize the keyboard layout as desired. Keyboards and keypads may be illuminated from inside, especially on equipment for mobile use. Both keyboards built into computers and external ones may support backlighting; external backlit keyboards may have a wired USB connection, or be connected wirelessly and powered by batteries. Illumination facilitates the use of the keyboard or keypad in dark environments. For general productivity, only the keys may be uniformly backlit, without distracting light around the keys. Many gaming keyboards are designed to have an aesthetic as well as functional appeal, with multiple colours, and colour-coded keys to make it easier for gamers to find command keys while playing in a dark room. Many keyboards not otherwise illuminated may have small LED lights in a few important function keys, or elsewhere on the housing, if their function is activated (see photo). In the first electronic keyboards in the early 1970s, the key switches were individual switches inserted into holes in metal frames. These keyboards cost from 80 to 120 USD and were used in mainframe data terminals. The most popular switch types were reed switches (contacts enclosed in a vacuum in a glass capsule, affected by a magnet mounted on the switch plunger). In the mid-1970s, lower-cost direct-contact key switches were introduced, but their life in switch cycles was much shorter (rated ten million cycles) because they were open to the environment. This became more acceptable, however, for use in computer terminals at the time, which began to see increasingly shorter model lifespans as they advanced. In 1978, Key Tronic Corporation introduced keyboards with capacitive-based switches, one of the first keyboard technologies not to use self-contained switches. There was simply a sponge pad with a conductive-coated Mylar plastic sheet on the switch plunger, and two half-moon trace patterns on the printed circuit board below. As the key was depressed, the capacitance between the plunger pad and the patterns on the PCB below changed, which was detected by integrated circuits (IC). These keyboards were claimed to have the same reliability as the other "solid-state switch" keyboards such as inductive and Hall-effect, but competitive with direct-contact keyboards. Prices of $60 for keyboards were achieved, and Key Tronic rapidly became the largest independent keyboard manufacturer. Meanwhile, IBM made their own keyboards, using their own patented technology: Keys on older IBM keyboards were made with a "buckling spring" mechanism, in which a coil spring under the key buckles under pressure from the user's finger, triggering a hammer that presses two plastic sheets (membranes) with conductive traces together, completing a circuit. This produces a clicking sound and gives physical feedback for the typist, indicating that the key has been depressed. The first electronic keyboards had a typewriter key travel distance of 0.187 inches (4.75 mm), keytops were a half-inch (12.7 mm) high, and keyboards were about two inches (5 cm) thick. Over time, less key travel was accepted in the market, finally landing on 0.110 inches (2.79 mm). Coincident with this, Key Tronic was the first company to introduce a keyboard that was only about one inch thick. And now keyboards measure only about a half-inch thick. Keytops are an important element of keyboards. In the beginning, keyboard keytops had a "dish shape" on top, like typewriters before them. Keyboard key legends must be extremely durable over tens of millions of depressions, since they are subjected to extreme mechanical wear from fingers and fingernails, and subject to hand oils and creams, so engraving and filling key legends with paint, as was done previously for individual switches, was never acceptable. So, for the first electronic keyboards, the key legends were produced by two-shot (or double-shot, or two-color) molding, where either the key shell or the inside of the key with the key legend was molded first, and then the other color molded second. But, to save cost, other methods were explored, such as sublimation printing and laser engraving, both methods which could be used to print a whole keyboard at the same time. Initially, sublimation printing, where a special ink is printed onto the keycap surface and the application of heat causes the ink molecules to penetrate and commingle with the plastic modules, had a problem because finger oils caused the molecules to disperse, but then a necessarily very hard clear coating was applied to prevent this. Coincident with sublimation printing, which was first used in high volume by IBM on their keyboards, was the introduction by IBM of single-curved-dish keycaps to facilitate quality printing of key legends by having a consistently curved surface instead of a dish. But one problem with sublimation or laser printing was that the processes took too long and only dark legends could be printed on light-colored keys. On another note, IBM was unique in using separate shells, or "keycaps", on keytop bases. This might have made their manufacturing of different keyboard layouts more flexible, but the reason for doing this was that the plastic material that needed to be used for sublimation printing was different from standard ABS keytop plastic material. "Monoblock" keyboard designs were developed where individual switch housings were eliminated and a one-piece "monoblock" housing used instead. This was possible because of molding techniques that could provide very tight tolerances for the switch-plunger holes and guides across the width of the keyboard so that the key plunger-to-housing clearances were not too tight or too loose, either of which could cause the keys to bind. The use of contact-switch membrane sheets under the monoblock. This technology came from flat-panel switch membranes, where the switch contacts are printed inside of a top and bottom layer, with a spacer layer in between, so that when pressure is applied to the area above, a direct electrical contact is made. The membrane layers can be printed by very-high volume, low-cost "reel-to-reel" printing machines, with each keyboard membrane cut and punched out afterwards. Plastic materials played a very important part in the development and progress of electronic keyboards. Until "monoblocks" came along, GE's "self-lubricating" Delrin was the only plastic material for keyboard switch plungers that could withstand the beating over tens of millions of cycles of lifetime use. Greasing or oiling switch plungers was undesirable because it would attract dirt over time which would eventually affect the feel and even bind the key switches (although keyboard manufacturers would sometimes sneak this into their keyboards, especially if they could not control the tolerances of the key plungers and housings well enough to have a smooth key depression feel or prevent binding). But Delrin was only available in black and white, and was not suitable for keytops (too soft), so keytops use ABS plastic. However, as plastic molding advanced in maintaining tight tolerances, and as key travel length reduced from 0.187-inch to 0.110-inch (4.75 mm to 2.79 mm), single-part keytop/plungers could be made of ABS, with the keyboard monolocks also made of ABS. Computer keyboards include control circuitry to convert key presses into key codes (usually scancodes) that the computer's electronics can understand. The key switches are connected via the printed circuit board in an electrical X-Y matrix where a voltage is provided sequentially to the Y lines and, when a key is depressed, detected sequentially by scanning the X lines. The first computer keyboards were for mainframe computer data terminals and used discrete electronic parts. The first keyboard microprocessor was introduced in 1972 by General Instruments, but keyboards have been using the single-chip 8048 microcontroller variant since it became available in 1978. The keyboard switch matrix is wired to its inputs, it converts the keystrokes to key codes, and, for a detached keyboard, sends the codes down a serial cable (the keyboard cord) to the main processor on the computer motherboard. This serial keyboard cable communication is only bi-directional to the extent that the computer's electronics controls the illumination of the caps lock, num lock and scroll lock lights. One test for whether the computer has crashed is pressing the caps lock key. The keyboard sends the key code to the keyboard driver running in the main computer; if the main computer is operating, it commands the light to turn on. All the other indicator lights work in a similar way. The keyboard driver also tracks the Shift, alt and control state of the keyboard. When pressing a keyboard key, the key contacts may "bounce" against each other for several milliseconds before they settle into firm contact. When released, they bounce some more until they revert to the uncontacted state. If the computer were watching for each pulse, it would see many keystrokes for what the user thought was just one. To resolve this problem, the processor in a keyboard (or computer) "debounces" the keystrokes, by aggregating them across time to produce one "confirmed" keystroke. Some low-quality keyboards also suffer problems with rollover (that is, when multiple keys pressed at the same time, or when keys are pressed so fast that multiple keys are down within the same milliseconds). Early "solid-state" keyswitch keyboards did not have this problem because the keyswitches are electrically isolated from each other, and early "direct-contact" keyswitch keyboards avoided this problem by having isolation diodes for every keyswitch. These early keyboards had "n-key" rollover, which means any number of keys can be depressed and the keyboard will still recognize the next key depressed. But when three keys are pressed (electrically closed) at the same time in a "direct contact" keyswitch matrix that doesn't have isolation diodes, the keyboard electronics can see a fourth "phantom" key which is the intersection of the X and Y lines of the three keys. Some types of keyboard circuitry will register a maximum number of keys at one time. "Three-key" rollover, also called "phantom key blocking" or "phantom key lockout", will only register three keys and ignore all others until one of the three keys is lifted. This is undesirable, especially for fast typing (hitting new keys before the fingers can release previous keys), and games (designed for multiple key presses). As direct-contact membrane keyboards became popular, the available rollover of keys was optimized by analyzing the most common key sequences and placing these keys so that they do not potentially produce phantom keys in the electrical key matrix (for example, simply placing three or four keys that might be depressed simultaneously on the same X or same Y line, so that a phantom key intersection/short cannot happen), so that blocking a third key usually isn't a problem. But lower-quality keyboard designs and unknowledgeable engineers may not know these tricks, and it can still be a problem in games due to wildly different or configurable layouts in different games. There are several ways of connecting a keyboard to a system unit (more precisely, to its keyboard controller) using cables, including the standard AT connector commonly found on motherboards, which was eventually replaced by the PS/2 and the USB connection. Prior to the iMac line of systems, Apple used the proprietary Apple Desktop Bus for its keyboard connector. Wireless keyboards have become popular. A wireless keyboard must have a transmitter built in, and a receiver connected to the computer's keyboard port; it communicates either by radio frequency (RF) or infrared (IR) signals. A wireless keyboard may use industry standard Bluetooth radio communication, in which case the receiver may be built into the computer. Wireless keyboards need batteries for power, and may be at risk of data eavesdropping. Wireless solar keyboards charge their batteries from small solar panels using natural or artificial light. The 1984 Apricot Portable is an early example of an IR keyboard. Speech recognition converts speech into machine-readable text (that is, a string of character codes). This technology has also reached an advanced state and is implemented in various software products. For certain uses (e.g., transcription of medical or legal dictation; journalism; writing essays or novels) speech recognition is starting to replace the keyboard. However, the lack of privacy when issuing voice commands and dictation makes this kind of input unsuitable for many environments. Unencrypted wireless Bluetooth keyboards are known to be vulnerable to signal theft by placing a covert listening device in the same room as the keyboard to sniff and record Bluetooth packets for the purpose of logging keys typed by the user. Microsoft wireless keyboards 2011 and earlier are documented to have this vulnerability. Keystroke logging can be achieved by both hardware and software means. Hardware key loggers are attached to the keyboard cable or installed inside standard keyboards. Software keyloggers work on the target computer's operating system and gain unauthorized access to the hardware, hook into the keyboard with functions provided by the OS, or use remote access software to transmit recorded data out of the target computer to a remote location. Some hackers also use wireless keylogger sniffers to collect packets of data being transferred from a wireless keyboard and its receiver, and then they crack the encryption key being used to secure wireless communications between the two devices. Keyboards are also known to emit electromagnetic signatures that can be detected using special spying equipment to reconstruct the keys pressed on the keyboard. Neal O'Farrell, executive director of the Identity Theft Council, revealed to InformationWeek that "More than 25 years ago, a couple of former spooks showed me how they could capture a user's ATM PIN, from a van parked across the street, simply by capturing and decoding the electromagnetic signals generated by every keystroke," O'Farrell said. "They could even capture keystrokes from computers in nearby offices, but the technology wasn't sophisticated enough to focus in on any specific computer." Proper ergonomic design of computer keyboard desks is necessary to prevent repetitive strain injuries, which can develop over time and can lead to long-term disability. Research suggests that the upright position formerly advocated can lead to degenerative disc disease, and that a 45 degree reclined position is healthier. Some adaptive technology ranging from special keyboards, mouse replacements and pen tablet interfaces to speech recognition software can reduce the risk of injury. Pause software reminds the user to pause frequently. Switching to a much more ergonomic mouse, such as a vertical mouse or joystick mouse may provide relief. By using a touchpad or a stylus pen with a graphic tablet, in place of a mouse, one can lessen the repetitive strain on the arms and hands. Some keyboards were found to contain five times more potentially harmful germs than a toilet seat. This can be a concern when using shared keyboards; the keyboards can serve as vectors for pathogens that cause the cold, flu, and other communicable diseases easily spread by indirect contact. ^ "computer keyboard". TheFreeDictionary.com. Retrieved 26 June 2018. ^ "Engraved symbols filled with pigmented plastic and heat fused are very durable, for example. ... It's integral to the key, and all but impossible to wear off." "How are keyboards keys painted?". ^ Khalid Saeed (2016). New Directions in Behavioral Biometrics. ISBN 1315349310. ^ "Essay on Technology Advancements in Computer Interfaces". ^ Smith, Andy (15 June 2011). "Gallery: IBM: 100 Years of THINKing Big". ZDNet. Archived from the original on 10 December 2015. Retrieved 20 October 2015. ^ "Past is prototype: The evolution of the computer keyboard". ComputerWorld.com. 2 November 2012. ^ D Kocielinski (2013). "Linear interface for graphical interface of touch-screen". ^ "One of the first products we caught wind of at the Consumer Electronics Show was the TrewGrip keyboard, a handheld model" "TrewGrip handheld keyboard almost a solution for thumb-typing". 11 January 2014. ^ "Jul 28, 2009 - If you do a lot of typing, or if you have employees who do a lot of typing - ergonomic keyboards make a great deal of sense." "10 ergonomic keyboards that actually do their job". TechRepublic.com. 28 July 2009. ^ Alpha Grip Programming and Productivity Improvement White Paper Archived 25 February 2015 at the Wayback Machine. Alphagrips.com. Retrieved on 9 December 2013. ^ The Alphagrip – The World's most Comfortable Ergonomic Keyboard for Typing and Programming Archived 25 February 2015 at the Wayback Machine. Alphagrips.com. Retrieved on 9 December 2011. ^ "It combines the body of a game controller with the functions of both a trackball and a keyboard." "AlphaGrip Review (iGrip)". 9 February 2018. ^ MB Trudeau (2013). "Tablet Keyboard Configuration Affects Performance, Discomfort". ^ Ian Morris (23 May 2014). "Hate Your Android Keyboard? Try One Of These Four Alternatives". Forbes. ^ "What is an Optical Keyboard?". ^ "How to Change the Keyboard Input Language in Windows 7". ^ "Dedicated Cursor Control and Navigation Keys". ^ "Keyboard, num lock and caps lock key LED's not working". ^ a b "Nearly all of the time pressing the ESCAPE key ... will work to get out of dialogs" "The Qodem Homepage". SourceForge. 18 June 2017. ^ Pagan Kennedy (5 October 2012). "Who Made That Escape Key?". NYTimes.com. ^ "... ESCAPE key to quit and input another command." "Kermit Manual". ^ No ESC key: see photo "VT05". ^ "ASCII Table - ANSI Escape sequences". ^ "Accessing Alternate Graphic Character Sets". ^ "Keyboard shortcuts in Windows". microsoft.com. ^ "Use a keyboard layout for a specific language". Archived from the original on 24 September 2010. Retrieved 7 October 2010. ^ "Changing The Language & Keyboard Layout On Various Distributions". Archived from the original on 1 July 2010. Retrieved 7 October 2010. ^ "Change the default keyboard layout". Archived from the original on 12 September 2010. Retrieved 7 October 2010. ^ Brownie, John (8 March 2014). "Ukelele [sic]". NRSI: Computers & Writing Systems. SIL International. Archived from the original on 6 December 2014. Retrieved 8 December 2014. ^ "The Microsoft Keyboard Layout Creator". msdn.microsoft.com. Archived from the original on 19 January 2010. ^ Kenneth Kimari (2 September 2018). "10 best backlit keyboards to buy". Windows Report. Retrieved 19 March 2019. ^ "Keyboard Switches - How Computer Keyboards Work". ^ Complete Computer Hardware Only. p. 159. ^ "Why I Use the IBM Model M Keyboard That's Older Than I Am". SlashDot.org. 7 July 2018. ^ A Passion for the Keys: Particular About What You Type On? Relax – You're Not Alone. Archived 10 August 2017 at the Wayback Machine Loose Wire, by Jeremy Wagstaff, Wall Street Journal, 23 November 2007. ^ "Electrical commutation matrixer keyboards for computers". IOPscience.org. ^ Complete Computer Hardware Only. p. 161. ^ "This Fake Phone Charger Is Actually Recording Every Key You Type". TechCrunch. AOL. 14 January 2015. Archived from the original on 10 August 2017. ^ "6 Tips To Secure Webcams, Stop Keyloggers". Dark Reading. Archived from the original on 30 December 2013. ^ Berkeley Lab. Integrated Safety Management: Ergonomics Archived 11 October 2008 at the Wayback Machine. Website. Retrieved 9 July 2008. ^ Radiology Society of North America The Way You Sit Will Never Be the Same! Alterations of Lumbosacral Curvature and Intervertebral Disc Morphology in Normal Subjects in Variable Sitting Positions Using Whole-body Positional MRI Archived 13 October 2014 at the Wayback Machine. ^ "How To Prevent Carpal Tunnel Syndrome: 9 Hand & Wrist Exercises". ^ "Sharp Edges on Mac Book Pro". ^ "Wrist Rests : OSH Answers". ^ "Keyboard: Dirtier Than a Toilet – ABC News". Abcnews.go.com. 5 May 2008. Archived from the original on 26 March 2012. Retrieved 28 March 2012. Wikimedia Commons has media related to Keyboards.